Melt the butter in a frying pan with the olive oil. 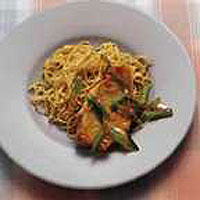 Add the pork steaks and fry gently for 25-30 minutes, or until thoroughly cooked, turning them halfway through cooking. Remove from the pan and keep warm. Add the salad onions to the pan and cook for 1 minute. Stir in the orange sauce, season to taste and heat for 2-3 minutes over a low heat. Pour the sauce over the steaks and serve immediately with freshly cooked egg noodles tossed in a little sesame oil.